So I really wanted some fries today. But number 1 I don’t want to deal with the hassle of deep frying, number 2 frying is really not good. 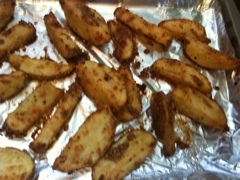 So I looked up some recipes for oven fries and none of them were really doing it for me. So I looked at the basics, you know seasoning ratio to oil ratio and came up with this tasty recipe! I microwaved the potatoes a bit first since i am extremely impatient! Next throw them in a bowl and toss together. save the Parmesan cheese for LAST! Especially if you are throwing them in the bowl after microwaving… cheese will get melty. Then put them on a cookie sheet skin side down. This should help with them not sticking. but for good measure spray a little pam on there. Baking times… so here’s the thing… I’m in japan using a microwave/ oven so it cooks differently from a regular oven. But here’s what i did… 180 degreesC for about 30 min (idk i lost track) or until they are crisp on the outside and i can stick a fork in through the inside (which is what I did). ***the cool thing about this recipe is you can add what ever you want. Next time I might add some rosemary!